Biological physics uses the tools and techniques of physics to understand the inner workings of the machinery found in living organisms on length scales ranging from the molecular to the macroscopic. Cornell supports a growing range of activities in biological physics, including investigations into fluctuations in biological systems, imaging of molecular motion, the physical mechanisms of molecular motors, properties of biological macromolecules, interactions in living cells, biomembrane structure and function, mechanical properties of chromosomes and biological macromolecules, molecular diffusion and receptor-ligand interactions on membranes, ion channel dynamics, the link between micron scale structure and macroscopic tissue response and aero-elasticity in insect flight. Physicists bring a quantitative approach to the study of biology, and an orientation toward seeking understanding at a fundamental level that is readily generalized to other systems. 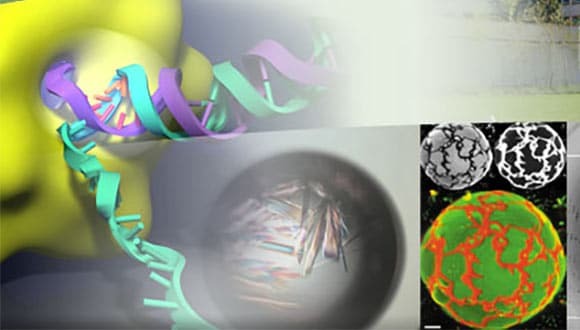 A defining characteristic of biological physics is the development of new instruments and techniques to better probe and manipulate biological materials. An example is optical traps, like the one shown in the figure, that stretch, twist and unzip individual DNA molecules. When coupled with high precision detection, these probe how DNA is packed and transcribed. Another example is the use of nanofabricated cells and synchrotron x-ray techniques to monitor protein folding. A third example is the application of techniques of solid state crystal growth to better understand the process of protein crystallization. A fourth example is the combined use of confocal microscopy and custom built shear cells to study tissue response under compression and shear. Professor Michelle Wang leads LASSP’s Single Molecule Biophysics Lab, which is unique in its abilities to manipulate “one molecule at a time” and measure the forces on that molecule. One role of the lab is to make biophysical measurements, such as studies of the packing of DNA in the nucleosome and studies of the molecules involved in gene expression and regulation.